Simple mistakes with simple solutions that can have a significant impact on quality, productivity and a company’s bottom line. 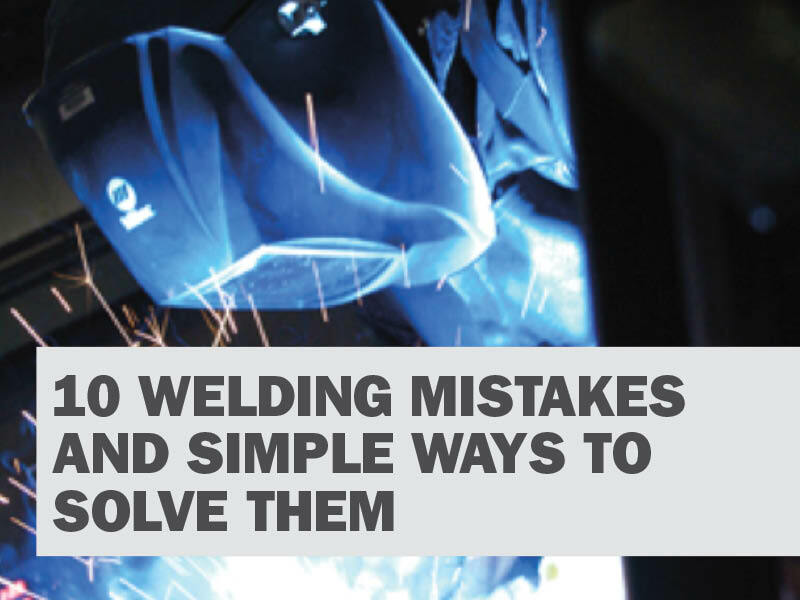 Mistakes in the welding operation are not uncommon, but many of them can have a significant impact on quality, productivity and a company’s bottom line. It is not uncommon for companies to preheat too little or skip this portion of the weld procedure altogether. Yet preheating is one of the biggest deterrents against cracking, as it slows down the cooling rate after welding. The type and thickness of the material being welded will determine preheat and interpass temperature. These requirements can be found in the application’s welding procedure, welding codes or other fabrication documents. For the best results, welding operators need to preheat the material completely through and extend the heated area to approximately three inches on either side of the weld joint. Welding should commence while the material is at or above the preheat temperature. Allowing the weldment to cool below the required interpass temperature may also lead to cracking. Using the correct type and/or mixture of shielding gas can help companies prevent weld defects, minimize excessive spatter and reduce costs for rework or post-weld cleanup. Shielding gases also determine arc characteristics and weld penetration on a given application. Straight CO2 provides good weld penetration, but it is prone to spatter and has a less stable arc than mixtures that include argon. High argon mixtures (a minimum of 85 percent argon for solid wire or as low as 75 percent for metal-cored wires) are the best choice. These mixtures can be used in the spray transfer process to promote higher deposition rates and generate less spatter. For TIG welding, the appropriate argon/helium mixture can improve speed, quality and arc characteristics. For both MIG and TIG welding operations, companies should purchase their shielding gas from a reputable welding distributor and be certain that it meets the purity requirements for their application. All gas delivery systems should be free of contaminants that could enter the weld puddle and welding operators should use the correct shielding gas flow rate. Too little gas flow won’t properly shield the molten weld pool, while too much flow can cause turbulence and aspirate air into the weld puddle. Protecting the weld puddle from drafts is also critical.